Players of browser-based star stalking game Planet Hunters may have helped scientists to identify two new exoplanets. The Kepler Space Telescope is a busy piece of space-machinery. Tasked with finding habitable planets outwith our solar system, it spends its time monitoring 200,000 stars and taking photos of them every thirty seconds. To help scientists deal with the massive amounts of data that Kepler sends home, researchers from several universities teamed up to build Planet Hunters, a browser-based game which tasks you with finding evidence of exoplanets in Kepler's data. Now, after their first month of searching, the game's users have found their first two possible exoplanets. 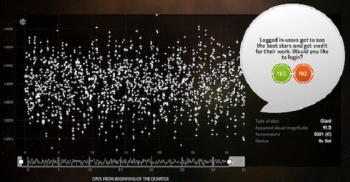 The Kepler mission creates its data by compiling the light fluctuations of a particular star over a 30 day period. If that light signal dips at any point, it could mean that a planet is passing between Kepler and the star; this is known as a transit pattern. Planet Hunters, seen in the accompanying screenshot, asks you to look through light data from several stars and decide whether or not you can see any transit patterns. If you think you see a transit, simply pull a small box over the time when the dip occurred and send your discovery off to the Kepler team. It can be a little difficult to tell what exactly you're meant to be looking for at first, but the site is littered with tutorials and guides to help you on your search. The Kepler team announced the discovery in this research paper, noting how pleased they were that regular users were able to accurately identify transit patterns. Earlier this month it was revealed that PC gamers helped to crack an AIDS-related protein problem which had eluded scientists for 15 years; now, they've helped to uncover two new exoplanets in deep space. Right now, the future of "citizen science" looks like a bright one.